Introducing a new class of stand‑alone simultaneous localization and mapping device, the Intel® RealSense™ Tracking Camera T265 for use in robotics, drones and more. With its small form factor and low power consumption, the Intel® RealSense™ Tracking Camera T265 has been designed to give you the tracking performance you want straight off‑the‑shelf. Cross‑platform, developer friendly simultaneous localization and mapping for all your robotics, drone and augmented reality rapid prototyping needs. Featuring highly optimized proprietary V‑SLAM algorithms running directly on the device, it operates at an incredible 1.5W. Extensively tested and validated for performance, providing under 1%1 closed loop drift under intended use conditions. At 108 x 25 x 13 mm in size and weighing only 55 g, this device won’t weigh your prototype down. SLAM, or Simultaneous Localization and Mapping, is a computational problem – how does a device construct or update a map of an unknown environment while simultaneously keeping track of it’s own location within that environment? 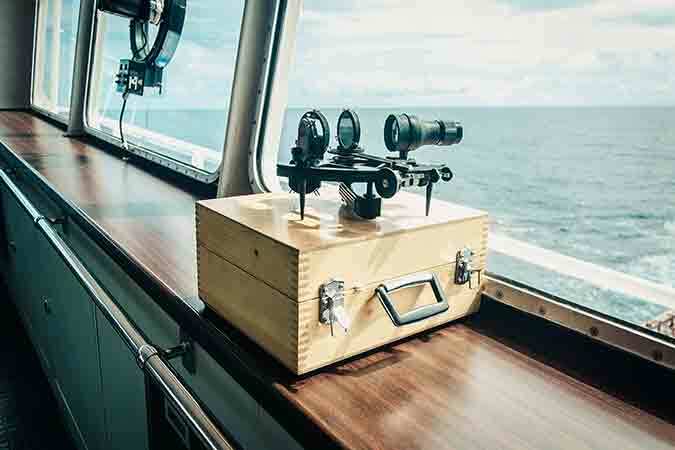 Before the days of GPS, sailors would navigate by the stars, using their movements and positions to successfully find their way across oceans. V‑SLAM uses a combination of cameras and Inertial Measurement Units (IMU) to navigate in a similar way, using visual features in the environment to track it’s way around even unknown spaces with accuracy. 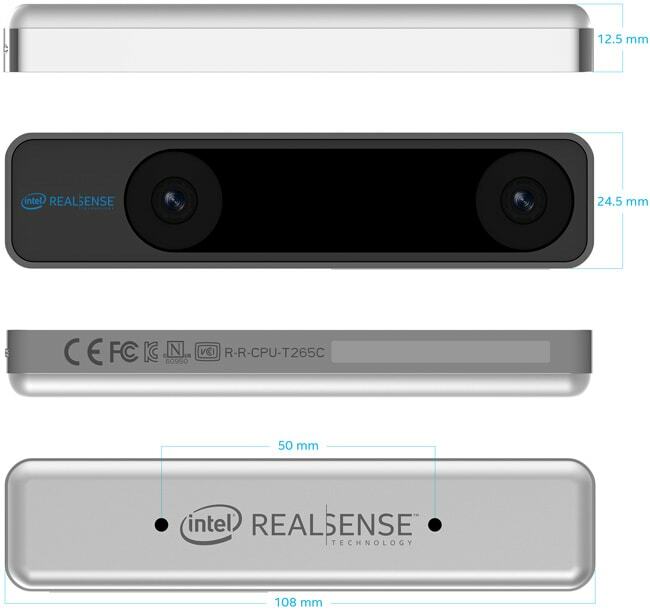 The Intel® RealSense™ Tracking Camera T265 includes two fisheye lens sensors, an IMU and an Intel® Movidius™ Myriad™ 2 VPU. All of the V‑SLAM algorithms run directly on the VPU, allowing for very low latency and extremely efficient power consumption. The T265 has been extensively tested and validated for performance, providing under 1% closed loop drift under intended use conditions. It also offers sub 6ms latency between movement and reflection of movement in the pose. This is fast enough for even highly‑sensitive applications such as Augmented and Virtual Reality. Robotics navigation, occupancy mapping and collision avoidance demo. 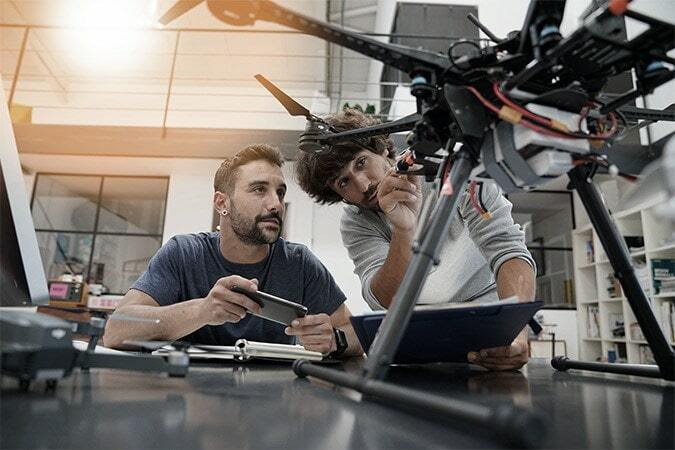 For developers working on a robotics, drone or augmented reality systems, SLAM can be challenging to implement – requiring significant time and resources in order to add valuable environmental understanding. With the T265, developers can now have precise and robust tracking that has been extensively tested in a variety of conditions and environments. This self‑contained tracking system is designed for simple integration. There’s no need to re‑design your board, simply plug in the provided USB cable and start streaming pose data straight away. The T265 also features an easy mounting solution, with standardized mounting sockets on the rear of the camera. While there are many use cases for a stand‑alone T265, it is definitely a part of the Intel® RealSense™ Technology family, and has been designed to work flawlessly along‑side our other devices. The T265 features an infrared cut filter over the lenses, allowing it to ignore the projected patterns from our D400 series depth cameras. This means that developers can utilize both devices together with ease for advanced applications such as occupancy mapping or collision avoidance and navigation in locations where GPS data isn’t available. The Inertial Measurement Unit, allows for accurate measurement of rotation and acceleration of the device, to feed into the V‑SLAM algorithms. Securely attach the camera to your device with these standard mounting points on the rear of the camera. 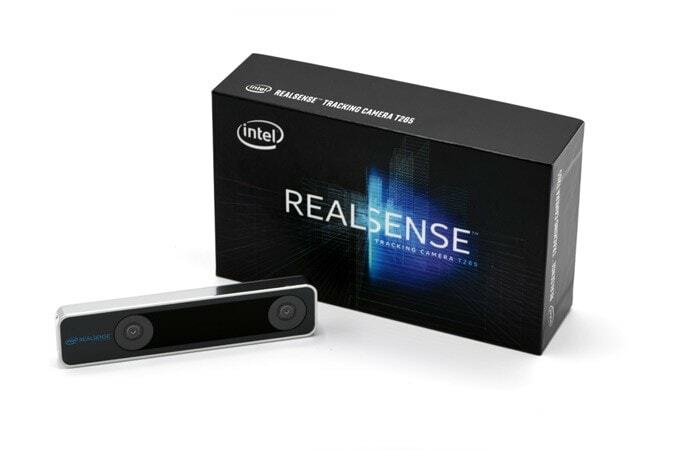 Intel® RealSense™ T265 is not a depth camera. It features two fisheye lenses for feature detection, but does not compute dense depth. It is possible to use the image feed from the cameras to compute dense depth, though the results will be poor compared to other Intel® RealSense™ depth cameras as lenses are optimized for wide tracking field of view rather than depth precision, and there is no texture projected onto the environment to aid with depth fill. 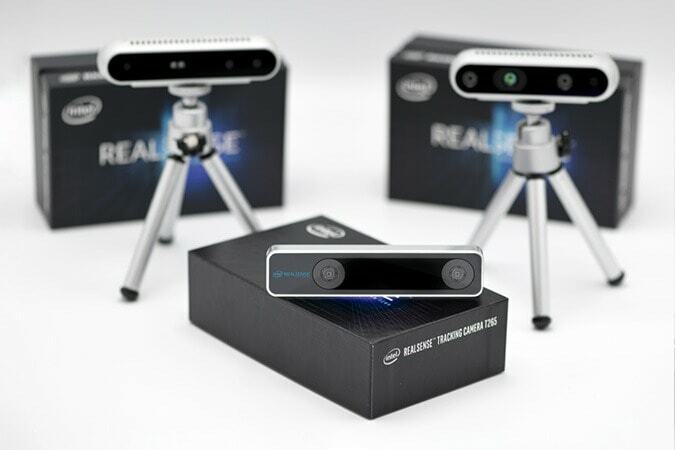 Can I run SLAM on Intel RealSense Depth cameras? Why would I need T265? All SLAM solutions, and there are many good ones, are limited by the information they receive. It is possible to run host-based SLAM using our D400 series depth cameras – ideally the D435i, however these cameras are optimized for depth accuracy at the expense of field of view – D400 cannot see as much of the world as T265. As such, a SLAM solution based on the information from a single D400 camera will get lost in certain situations when T265 will not. Furthermore, the T265 is optimized for power and latency using its embedded VPU. For these reasons, T265 will succeed in many use cases where D400 based SLAM will fail. Additionally, when using the T265, no additional resources are required on the platform in terms of compute to perform the SLAM algorithms, which means that tracking with T265 is platform independent, has a low integration cost, and can run on very low compute devices. For some use cases, SLAM on the D435i will be ideal, but for the highest quality tracking, choose the T265. For both quality depth and tracking, use the D415 and the T265 in parallel. What platforms does the T265 support? At launch T265 includes support for Windows and Ubuntu. The Host API library is open sourced so customers can port it to any platform they want. It has been run on Android successfully. The FW that runs inside T265 is independent of host platform, so the performance of T265 is also host independent. Since Intel RealSense T265 computes all tracking data on device, the only hardware requirements are a USB 2 or USB 3 connection that provides 1.5W of power, along with enough memory and compute to boot the T265 and receive the pose data and use it in your application. Can custom algorithms be added to the Intel® Movidius™ Myriad™ 2? The optimization of the algorithm on the VPU prevents it from being shared with other code or uses. Furthermore the thermal envelope of T265 is only large enough for the current workload. Can T265 re-localize after being kidnapped? Intel® RealSense™ T265 can re-localize after kidnapping, providing there are some features in view which are in its internal map. In the case of a completely new environment, it will continue to provide relative pose data until absolute position can be re-established. Can T265 work in low light conditions? While well-lit environments are preferable, T265 performs well at light levels as low as 15 lux, and depending on the exact structure of the light can sometimes continue to work at even lower light levels. An ideal operating environment for the T265 has a reasonable number of fixed, distinct visual features in view. It will perform poorly if the entire field of view contains moving, near field objects such as people. In cases where crowds are expected indoors, it is advised to point the camera upwards, where it can use features on the ceilings to navigate. Get the latest Intel RealSense news, product updates, event and webinar notifications and more. Stay informed about the latest trends and products in the computer vision industry. Our How-Tos and video tutorials cover everything from basics to advanced techniques. 1. Under 1% drift observed in repeated testing in multiple use cases and environments. AR/VR use cases were tested with the T265 mounted on the head in indoor living and office areas with typical indoor lighting including sunlight entering the room. Wheeled robot use cases tested with wheel odometer data integrated, again in indoor office and home environments. 2. Sufficient visibility of static tracked visual features is required, the device will not work in smoke, fog, or other conditions where the camera is unable to observe visual reference points.